Terminators take interest in Moldova, like one of the former socialist countries,. It is no coincidence. This country has the perfect internet coverage. 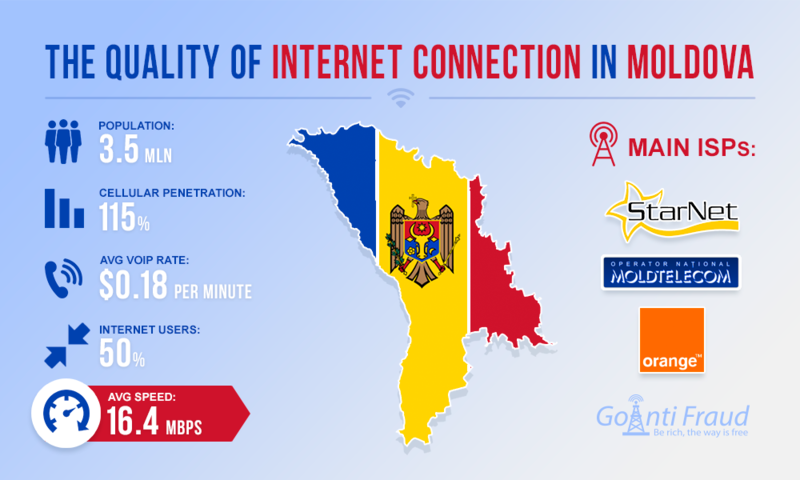 According to the study, Moldova provides the fastest and most high-quality internet among many CIS countries. Regarding the Internet speed, Moldova occupies the 17th place among 188 countries in the world. As for the web users, almost 50% of the population (3.5 million people), which is quite a lot, use the Internet. Moldova remains an attractive country for VoIP termination, due to the high quality of GSM communication and a lot of international traffic directed here. High-quality cellular communication is provided by the flat terrain and advanced telephony infrastructure. After the '90s, at the beginning of 2000 in the country there was a strong development of the market of Internet services. The experts counted more than 28 providers. There are 13 really operating companies providing Internet services in Moldova. The largest ones are Moldtelecom, Interdnestrcom, Starnet, and Arax. However, due to the rapid development of new wireless technologies, most of the companies offer broadband and fiber optic internet, and other companies provide combined packages TV + Internet for home users. And they both are not too suitable for a successful VoIP termination. It remains to be content with a modern ADSL, which Moldtelecom and offer. These two giants cover almost the entire country with the World Wide Web. Moldtelecom provides online only for Moldova, Interdnestrcom for Transnistria. If we compare the speed, the bandwidth provided by Moldtelecom is 40 Gb/s, and Interdnestrcom provide 30 Gb/s. According to the experienced terminators, the Moldtelecom offers the highest quality, fast and reliable internet connection, it is the best in the telecommunications marke as he has a low ping at high speeds. Terminators believe that the optimal package for Voip Solution is MaxDsl from Moldtelecom. For these connections the provider offers 4 tariff plans with unlimited Internet. These packages vary in internet speed and price. MaxDSL Business 300 will suit for termination at a rate of 5 MB/s and a monthly subscription fee of $15.18. Interdnestrcom offers 7 ADSL packages with unlimited bandwidth. In this case, each of them takes into account the speed limits from 256 kb/s to 2,048 kb/s, depending on the Internet provided from 8 a.m. to 12 p.m. and from 12 p.m. to 8 a.m. However, the rate of termination via one channel should be about 64 kb/s, so it is better to install the multi-channel equipment that has from 8 to 32 ports, and connect the Internet of 2,048 Kb/s. From this point of view, the optimal Interdnestrcom package is "Mini +", providing the above download speed for $10 a month. Selecting tariff plans depends on the preferences of the terminator. At an average cost of VoIP minutes Moldova $0.2316, the income will be $0.2306 per minute, with one channel. With an average load of 5 hours, the income will amount to $2,075.4 a month from one channel. When installing multichannel equipment, the resulting sum is multiplied by the number of ports that the device has. The amount of revenue is very impressive. According to experienced Moldova terminators, you can get a tangible return without problems.